The Piqua girls are in the Dayton 1 Troy sectional. Piqua, 12-6 and looking for its first tournament win in 17 years, will open D-I sectional play at 2:30 p.m. Feb. 16 at Troy High School. The 11th seeded Lady Indians will play 12th seeded Springfield, 8-11. The winner will play third seed Fairmont, 12-8, at 6 p.m. on Feb. 19 at 6 p.m. The sectional final is set for 6 p.m. on Feb. 25. 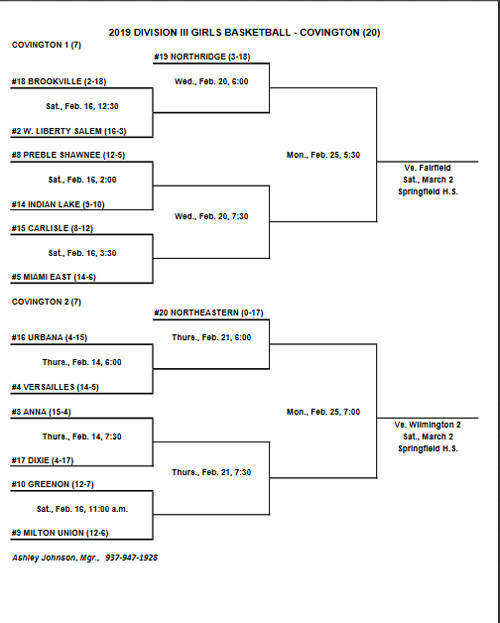 Versailles received the fourth seed in the Covington D-III sectional. 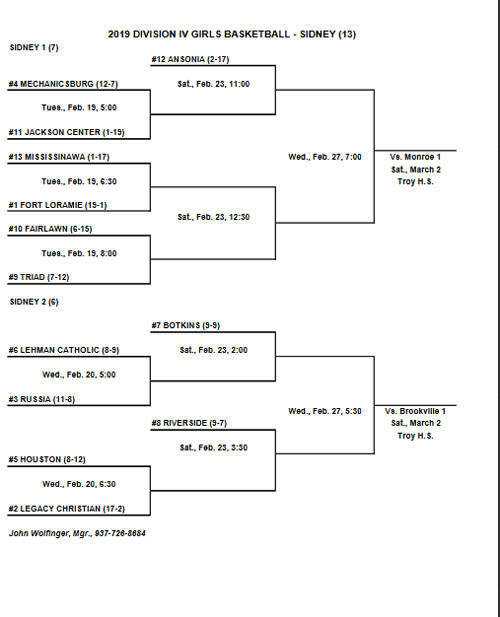 The Lady Tigers, 14-5, will open tournament play against 16th seed Urbana, 4-15 at 6 p.m. Feb. 14. The winner will play 20th seed Northeastern, 0-17, at 6 p.m. Feb. 21. The sectional final is set for 7 p.m. Feb. 25. Third seed Anna is also in Versailles’ half of the bracket. Covington received the second seed and is in the upper bracket, while Bradford received the sixth seed and is in the lower bracket. 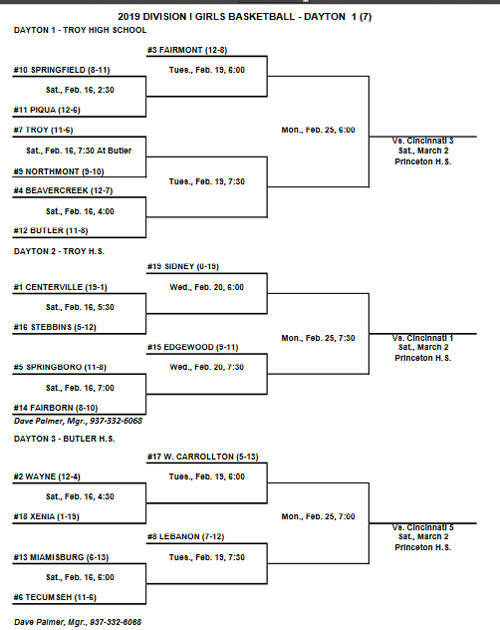 The Lady Buccs, 15-3, will open tournament play at 11 a.m. Feb. 16 against 1-17 Tri-Country North, the 13th seed. The winner will play 14th seed Jefferson, 0-15, at 6 p.m. Feb. 20. The sectional final is set for 7:30 p.m. on Feb. 27 and third seed Franklin Monroe and fourth seed Troy Christian are in Covington’s half of the bracket. Bradford, 14-6, will open tournament play at 8:30 p.m. Feb. 13 against eighth seed Yellow Springs, 10-8. The winner will play the winner of 12th seed Dayton Christian, 5-9 and fifth seed Catholic Central, 14-4 at 7:30 p.m. Feb. 19. 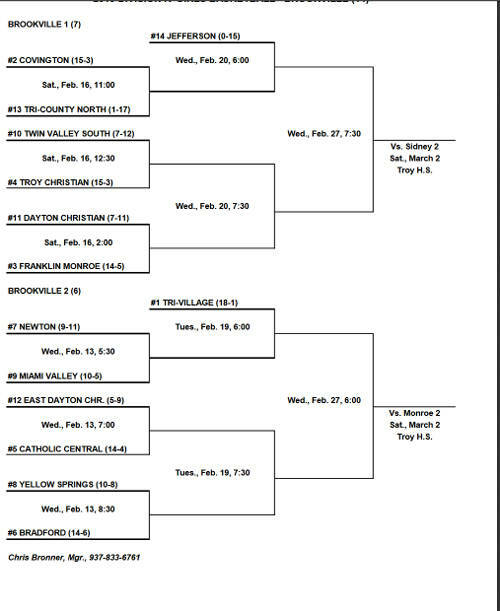 The sectional final is set for 6 p.m. Feb. 27 and top seed Tri-Village is also in Bradford’s half of the bracket. Lehman Catholic, Russia and Houston are all in the lower bracket at Sidney. On Feb.20, Lehman (sixth seed, 8-9) will play Russia (third seed, 11-8) at 5 p.m., followed by fifth seed Houston, 8-12, playing second seed Legacy Christian, 17-2 at 6:30 p.m.
On Feb. 23, the Lehman Catholic-Russia winner will play seventh seed Botkins, 9-9, at 2 p.m.; followed by the Houston-Legacy Christian winner playiing eighth seed Riverside, 9-7, at 3:30 p.m.
Those winners will play in the sectional final at 5:30 p.m. on Feb. 27.